Here are some more in process photos of Kristy's single speed hardtail. The head tube rings are machined on the front side of the tube only....this leaves more material on the back side of the tube for strength. Machining rings into head tubes is common across the industry...but machining eccentric (off-center) rings is more difficult and is rarely seen on production frames. Small vent holes inside the frame allow the inside tube surfaces to be purged with nitrogen; this gas runs through the red flexible tubing which is attached to the welding fixture. This means no impurities will be present after welding which is important since inspecting inside the frame is nearly impossible with conventional tools. Prior to welding, all key joint surfaces are thoroughly cleaned and deburred. The Easton Ultralite 'pear shaped' down tube is bi-ovalized for strength and maximum weld area at the head tube and BB shell. 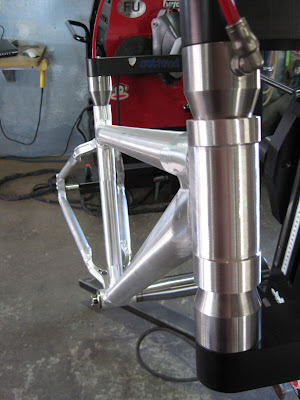 This tube is so tall it accounts for more than half the real estate of the head tube! As a result, the top tube receives an interference cut to 'cup' the down tube and head tube for the ideal mating fit. The top tube is also bi-ovalized to maximize joint strength at either end. 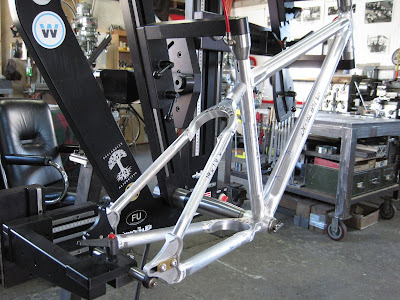 The rear triangle components are pre-assembled ahead of time in a special fixture designed by Anvil and then integrated into the main Anvil fixture to create a complete frame. The rear dropouts are spaced slightly wide at 137mm to account for slight spring-back which can happen when welding bike frames. In this case, the spring back is minimal due to the shape and rigidity of the upper/lower yoke components. 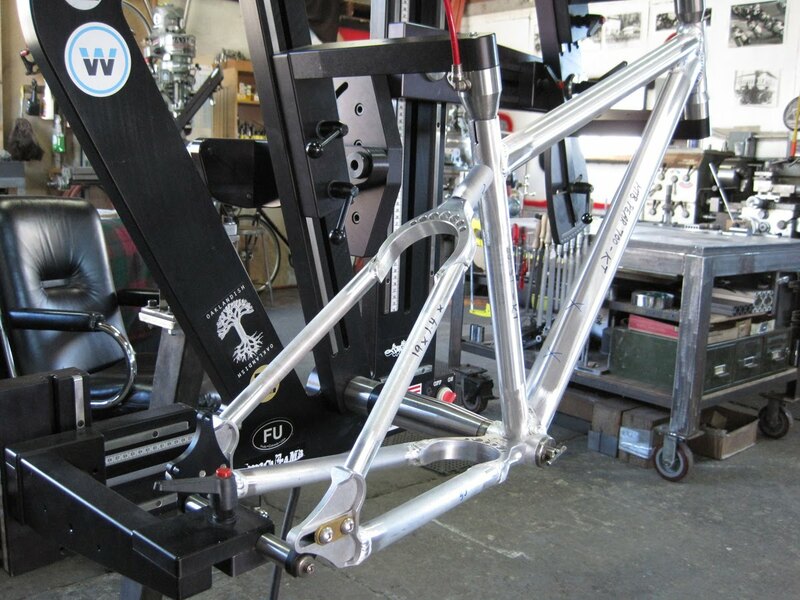 During fabrication, the sliding dropouts are positioned all the way forward which translates into a 16.5" chainstay length (measured center-to-center). Once the bike is assembled, the sliders will be re-positioned between 16.5-17.2" depending on the desired riding characteristics. I usually set this distance to ~16.8" to strike a balance between climbing and descending ability. Too short and the bike will be unruly during high-speed descents. Too long and climbing response is reduced. Since the dropouts can slide, it's very easy for the end user to dial in their ideal chainstay length on their home turf. When working with aluminum, material availability can become an issue since it's imported in very small quantities to the USA. 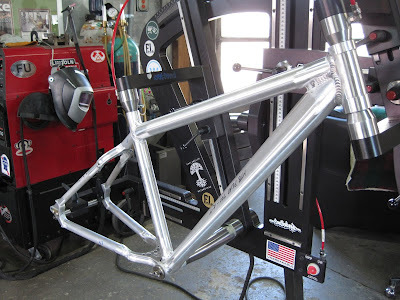 As a result, I've started to develop frames using round rear stays (in lieu of rectangular tubes) that are hand-formed for the ideal fit before welding. In this case, the chainstays are 25mm round and then swaged near the dropout joint. The seatstays are 22mm diameter tubes with similar treatment as the chainstays. The ride quality of the round tubes is excellent and on par with the classic rectangular stays used up to this point. I expect this frame to weigh in under 3.6 lbs which should provide an excellent platform for single speeding!